Dr. Tetsuji Yamada is currently a professor of Health Economics for the Department of Economics, an Associate Faculty for the Graduate Faculty of M.A. and Ph.D. programs for the Department of Childhood Studies. He has taught Health Economics and Health Care, Economics of Health Behavior and Health Education, Health Care Finance, Cost-benefit Analysis, Pharmaceutical Economics, and Managerial Economics at Rutgers. Dr. Yamada is also a researcher for the Walter H. Shorenstein Asia-Pacific Research Center, Comparative Health Policy Program, Stanford University. In addition, he is an Invited Research Scholar for Department of Community Health and Preventive Medicine, Hamamatsu University School of Medicine in Japan, and is a Research Scholar for Hosei Institute on Aging, Hosei University in Japan. Previously, Dr. Yamada was an Associate Professor for the Department of Economics of Ritsumeikan University in Kyoto, Japan. He taught microeconomics and seminars for undergraduate, graduate, and doctoral students. He earned his Ph.D. and M.Phil. in Health Economics from the Graduate School and University Center of the City University of New York; M.I.A. in International Affairs and Public Policies from Columbia University; and B.A. in Economics from Toyo University in Japan. His current research includes: studies in health economics, i.e. cancer screening behavior, alcohol and drug abuse, risky health behavior among the youth and children, teen pregnancy prevention, elderly care and preventive care, accessibility of health care services and health disparity, unmet and delayed health care services, pharmaceutical innovation and health outcomes, health insurance and health outcomes, effectiveness of government health care policy, etc. He is also interested in government healthcare policy and health marketing in both the U.S. and other international settings (e.g. Japan and Taiwan). His work has appeared in Applied Economics, Advance in Health Economics and Health Service Research, Contemporary Economic Policy, Contemporary Policy Issues, Economic Studies Quarterly, GENEVA Paper on Risk and Insurance, Health Economics, Health Policy, International Economic Journal, International Journal of Environmental Research in Public Health, International Journal of Health and Nutrition, International Journal of Transport Economics, International Political Economy, Japan and the World Economy, Journal of Cancer Education, Japanese Economic Review, Journal of Children and Poverty, Journal of Human Resources, Journal of Insurance and Risk Management, Journal of the Japanese and International Economies, Journal of Children and Poverty, Open Economic Journal, Open Pharmacoeconomics & Health Economics Journal, Quarterly Review of Economics and Finance, Quarterly Review of Economics and Business, Quarterly of Social Security Research, Social Science & Medicine, National Bureau of Economic Research (NBER) Working Papers, Time in Economic Theory, WHO Publication, Edward Elgar Publishing, University of Chicago Press for the NBER, Elsevier Science, etc. Dr. Tetsuji is doing research on “accessibility to healthcare services and health disparity” with Japanese researcher as an Invited Research Scholar, Department of Community Health and Preventive Medicine of Hamamatsu University School of Medicine, Japan and on “aging issues” with Japanese researchers as a Research Scholar of the Hosei on Aging in Hosei University, Japan. He is currently a researcher for the Walter H. Shorenstein Asia-Pacific Research Center, ASIA Health Policy Program, Stanford University; California. 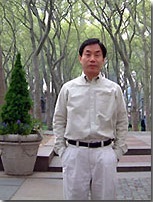 Dr. Yamada is currently an Advisor of the Committee on Aging Issues, the Japanese American Associate of New York, serves on the Academic Advisory Board for Taking Sides: Clashing Views on Economic Issues and Clashing Views in Global Issues by McGraw-Hill Contemporary Learning Series. For an editorial contribution, he serves as the Editor in Chief of Journal of Health Behavior and Public Health; the Guest Editor of Special Issue on “Health Behavior and Public Health,” International Journal of Environmental Research and Public Health; the Section Editor of Business Economics of the IIOAB Journal; and Editor (and Editorial Board), Journal of Tropical Disease, October 2012-present. Dr. Yamada also serves as an Editorial Advisory Board Member for Health Care in Scientific Journals International; an Editorial Advisory Board Member for Economics in Scientific Journals International; an Editorial Board Member of the International Journal of Applied Economics; an Editorial Board Member of the IIOAB Journal: Institute of Integrative Omics and Applied Biotechnology; an Editorial Board Member of the International Journal of Health & Nutrition; and the Editorial/Reviewer Board for the Pakistan Journal of Business and Management. Dr. Yamada has experience as a Health Economist for the International Leadership Center on Longevity and Society, a Research Associate of NBER, an Associate Professor of Ritsumeikan University in Kyoto, Japan, a Faculty of Research Fellow of NBER, an adviser of WHO, and a Visiting Research Scholar of Tsukuba University in Japan, a Representative of the Japan Economic Federation, and an instructor of the City University of New York. He has been a member of several professional organizations: American Economic Association, American Public Health Association, American Society of Health Economist, International Health Economic Association, Omicron Delta Epsilon, etc. He has been internationally active in presenting research papers at various professional conferences. He is a referee and a reviewer for professional journals, books and research funding institutions. Page last updated by Department of Economics at 10:09 am August 24, 2018 . This page was printed from http://economics.camden.rutgers.edu/faculty/tetsuji-yamada/ at 10:46 PM Thursday, April 25, 2019.